A few years ago, my seemingly healthy grandmother fell critically ill. When her health worsened, she was hospitalized. Her children faced making some difficult medical decisions on her behalf. They worried their choices might not reflect her decisions, especially when it came to life-sustaining treatments or letting nature take its course. While doctors wanted to place her on a ventilator, her children were confused about what steps to take. My aunts and uncles asked my mom about what she did when my dad’s health failed from mesothelioma. Dad put his wishes in writing shortly after the oncologists confirmed his mesothelioma diagnosis. He didn’t want tough decisions to create anxiety for us, especially my mom. By filling out some legal papers, he took things into his own hands, and off our minds. Dad’s oncology team knew his wishes ahead of time and treated him accordingly. Planning for medical care in advance empowers patients to make their own decisions. Rather than placing the responsibility on family members, advanced directives allow patients to “take the bull by the horns” and voice their opinions and desires. In contrast, leaving end-of-life medical decisions in the hands of family can create a turbulent environment. Families want to fulfill their loved one’s wishes. But if the choices are not concrete, it is the family’s responsibility to make the decisions on behalf of their loved one. Lack of planning may leave those important decisions up for speculation and debate. Advanced directives come in many forms. 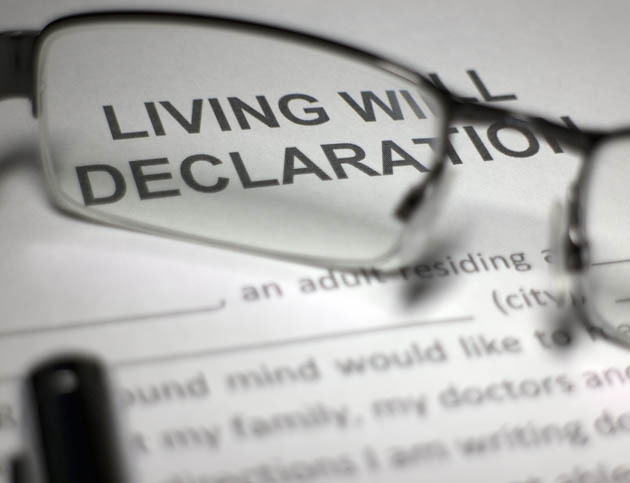 Living wills and medical powers of attorney are the primary types. My family’s experience with my dad’s mesothelioma taught me plenty about advanced directives. While I knew there were ways to plan for medical care, I didn’t know the specifics of how someone might begin the planning process. Ventilation: A ventilator is a medical device used for artificial respiration when a patient no longer breathes naturally. It’s sometimes called a respirator. Dialysis: When a patient’s kidneys no longer function, a dialysis machine filters wastes and fluids from the blood. Nutrition: If a patient cannot consume food and drink on their own, a feeding tube delivers nutrition to the patient. Organ and Tissue Donation: Even cancer patients opt to donate certain organs and tissues. A living will lets doctors know if a patient is interested in donating their organs. No document can prepare you for every medical scenario. But it helps to appoint a trusted person to make decisions for the patient when necessary. This person is called a medical power of attorney or a health care proxy. Patients can appoint anyone they trust to make these decisions. Many patients choose their spouse or an adult child they trust. It is important to understand that appointing a medical power of attorney does not relinquish patient authority. A patient is in charge of their own health care, and a medical power of attorney is only appointed to honor the patient wishes. If a patient changes their mind about who they appoint, they can make revisions. Most people don’t think about advanced directives unless they have a serious illness. However, even healthy people should draft a living will for peace of mind. If my health unexpectedly fails, I prefer making my own medical decisions. Each state has its own laws regarding advanced directives. The first step in developing a personal advanced directive is talking to your medical care team. Medical professionals are familiar with state laws and know where to begin. Some states require witnesses present when the patient signs the documents. Once the documents are reviewed and signed, patients are usually instructed to keep them in a safe place, give copies to their medical team and ensure their caregivers have access to them. Some patients carry a card in their purse or wallet to alert emergency medical professionals they have advanced directives on file, and where they can find them. You don’t want what happened with my grandmother to happen to you or your loved ones. A critical or terminal illness is already an overwhelming burden on a family. Planning ahead will lessen the stress on family and ensure your wishes are carried out.